With a certified fire rating of up to 4 hours, the range of Sunray Fire Doors are the specifiers choice for applications with a high risk of fire and as such provide a robust and maintenance free solution. Available in Single or double leaf options with or without over-panel and utilising the Surelock Mcgill three point panic bar system internally and Sunray’s Hasp and staple externally there is no compromise to security and safety. 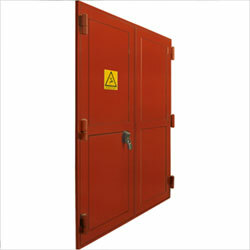 Sunray can supply a number of fire rated steel doors for security, commercial and industrial use. A selection of our ExcluDoor® FR doors have achieved 4 hour fire rating. Sunray’s SaverDoor® can be supplied in both single and double doorsets with a four hour rating. The single SaverDoor® can be supplied as a six hour fire rated door. 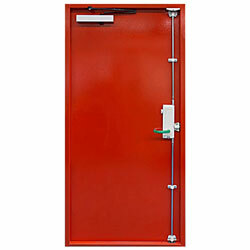 The FireLock® is supplied as a four hour rated door. Our ExluDoor® 3 & 4 are available with single, double or uneven door leafs and have a wide variety of locking combinations. They can also be fitter with our ExclueGlass® FR vision panel which has been fire tested up to 2 hours. 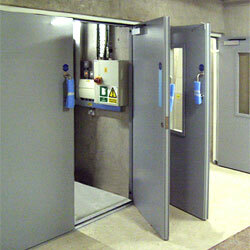 Our SaverDoors® are a versatile and cost effective quality steel fire door. Suitable for virtually and commercial application, they have a Fire rating from 4-6 hours dependent upon the door type. Sunray’s unique Firelock® Door has a four (4) hour fire rating and is manufactured to ensure exceptional integrity and strength. Whilst Firelock® is one of the most robust products in the portfolio it is simple to operate and low maintenance.